We take care of all the necessary Burocracy and Paperwork, including the documents needed before the wedding. We help and advise you on the choice of your Church ranging from the very simple early Medieval places of worship, the imposing Reanaissance churches to the more intricate Baroque churches. For a Civil Service we propose the Sala del Consiglio of the Town Hall of Cortona with its amazing painted ceiling, frescoed walls and Medici fireplace. We can arrange the Music you have always dreamed of ranging from classical to jazz to disco or even local traditional folk bands. Flowers and Plants of every possible colour and type can be carefully selected and displayed in the chosen location. Beauty treatments at the local spas, make-up and hair styling in the true Italian style. Photographs taken at every important moments before, during and after the ceremony. Wedding Party, taking care of the catering or suggesting you the best restaurants in the area. We help and advise you on the choice of the typical Italian “Bomboniere”(little gifts for the wedding guests) and invitations (hand-made ones on request. Transfert (from and to the airport) and accomodation in the most comfortable facilities of the area for you and your guests. We organize your arrival at the church or town hall with luxury cars, sidecars or coaches. We would be pleased to plan your Honeymoon throughout Tuscany and/or Italy. In case you wish to celebrate your wedding in complete privacy, we would be pleased to be your Witnesses . Translation service for you and your guests. 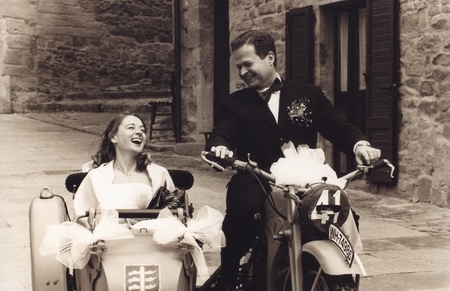 Reaffirmations: we offer you a chance to reaffirm your wedding vows with a blessing in the beautiful setting of Tuscany.